Get on board of our Airbus Eurocopter H-135, which can accomodate up to 6 persons. 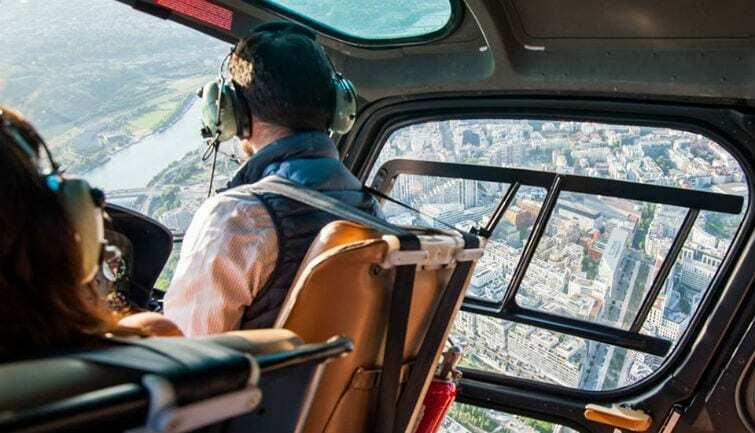 Depart from the only, historical Heliport of Paris right in the south of the city. You're in for a spectacular trip between Paris and Versailles! Join us for this 1,5 hour discovery of Paris from the sky. Depart for a 1,5 hour tour with 25 minutes of a sensational flight during which you will admire this stunning panorama: unique view on the Eiffel Tower and other Parisian must-see sites ! You will be discovering Paris by flying over the Seine and its bridges, the Château de Versailles and the gardens of the Roi Soleil, before stopping for a stopover at the Saint-Cyr airfield. A hot or fresh drink will be offered. Take advantage of this break to take pictures and ask any kind of questions about the helicopter to the pilot who will be delighted to share his experience. After the break, you will get on board again and fly over the west bank of the Seine, the Parc des Princes, the Bois de Boulogne, the Longchamp racecourse before ending the adventure with an open view of the Eiffel Tower and all of Paris. These schedules are indicative and are subject to availability. If the tour is unavailable for the selected date, we will contact you to arrange a suitable time. You will receive a confirmation within 48 hours of your reservation. No refunds will be possible for cancellations in the 3 weeks preceding the flight. Be sure to include a valid phone number in order to be notified of cancellations due to bad weather conditions. In case of cancellation, you will be informed the day before by an SMS and you will be able to reserve another flight. In the event of bad weather, the flight may be rescheduled at a different date. Please book your flight for one of the first days of your stay to allow for any changes. For safety reasons, the weight limit per person on board is 120kg.